A global aerospace and defense technology company would like to build an airship that would be carried into orbit with Venus, inflated with gas, then dropped into the planet's atmosphere to float around and take readings. Northrop Grumman Aerospace Systems has published an outline for an unconventional idea on NASA's website: a semi-buoyant, maneuverable vehicle that could operate in the upper atmosphere of Venus. A satellite would deliver this drone to our sister planet, inflate it, then let it float down into Venus' atmosphere. Ten Soviet probes have achieved a soft landing on Venus' surface in the past, and the result has been a mere 110 minutes of communication. Northrop Grumman's proposal of a probe that flies around in the planet's atmosphere circumvents the dangers of landing safely. 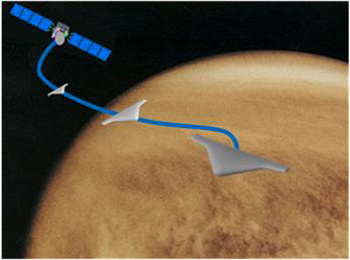 Called the Venus Atmospheric Maneuverable Platform (VAMP), the drone would be operational for an estimated duration of one year before losing too much gas to remain afloat. The drone would circle Venus every six days, powered by solar-powered propellers during the day and left to glide at night. The orbiting satellite would allow engineers on Earth to provide instructions to the probe and control it remotely. Should NASA fund this project, which would not require any new technology and thus could be developed relatively inexpensively, scientists could potentially have a new way to study our neighboring planets.